A superb guitar that delivers fantastic playability straight from the box. More twang than you'd expect from a short-scale guitar. Can we have a Road Worn Dakota Red Duo-Sonic, please? While the new Mexico-made, short-scale Fender Offset Series is rounded off with the Mustang Bass PJ (£539) featuring - you guessed it - both Precision and Jazz pickups, the bulk of this new range centres around two Duo-Sonic models and a pair of Mustangs. For this review, we snagged the classic format Duo-Sonic with two single coils. Digging deeper, all of the Offset Series guitars are based around the same compact double-cutaway alder carcass. In case you're scratching your head, 'offset' refers to the guitars' body waist, which is, well, offset. That's to say, the body contours are not a mirror image like the waist cutouts on, say, a Les Paul. Moving on, the spec is eerily similar across the range with each guitar sharing a string-thru body hardtail Strat bridge with a set of vintage-style bent-steel saddles. Flip the guitars over and you'll see six ferrules to anchor the strings. The build quality is excellent and you're good to go as soon as you take it out of the box. The Doppelgänger vibe continues with a 610mm (24-inch) bolt-on maple neck with a modern 241mm (9.5-inch) radius fingerboard playing host to 22 medium jumbo frets, a slick satin polyurethane finish and a perfectly cut 'synthetic bone' top nut. There are some differences that are worth pointing out. The Duo-Sonics have plain 'guards, chrome knurled 50s Tele flat-top knobs and the smaller pre-CBS headstock. 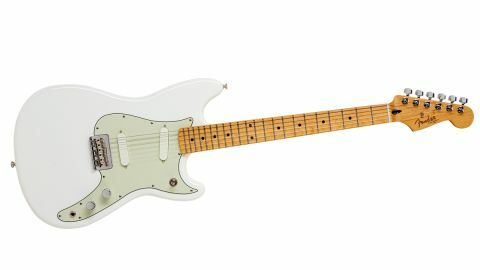 The Duo-Sonic features a 'modern C' neck profile has a bit of meat on its bones, yet doesn't compromise the user-friendly reputation of the short-scale Fenders. The chunky frets and 241mm (9.5-inch) fingerboard radius make for a low, buzz and choke-free action. Considering we're missing a clear inch-and-a-half off the classic Fender scale length with the Offset Series, we're taken aback by the sheer amount of twang boinging off the Duo-Sonics' bottom strings. You're getting so much of the big brother Fenders' tone here with easier fretting and string bending. All the Offset Series guitars come fitted with 0.010 to 0.046 gauge strings - a sensible option, but we'd probably go a gauge higher. Scoff all you like at these short-scale 'kids' guitars. You might not get off on the whole Kurt Cobain/grunge back story, but we all like guitars with good pedigree and faultless playability. The build quality is excellent and you're good to go as soon as you take it out of the box.